This paper assesses the usability of land prices as an indicator of the efficiency by which different delineations of a given city capture the influence area of that city. The case study used is Brussels (Belgium). A hedonic model of land prices (log-linear and semi-parametric specifications) is estimated for 12 different delineations of the city and on automatically constructed delineations. The assumption, grounded in the Alonso-Muth model, is that when local amenities have been controlled for, accessibility to the CBD parameter estimate will reflect the city influence on its delineation. Results show that both the size and composition of the delineations of Brussels influence the land price determinants. The size changes the spatial structure of land prices, which is best described by Hoyt’s sector model for narrow definitions of Brussels, and by Alonso-Muth type model for larger definitions. Composition induces variations in the magnitude of the influence of accessibility to the CBD on land prices, due to the presence of secondary centers or rural areas. The lack of detailed data on land prices limits the robustness of the results. Nevertheless, our findings show the potential of land prices as a tool for comparing delineations of a city, or to draw delineations of that city. Finally, they also suggest that delineations based on fluxes (e.g. commuting), and on endogenous thresholds, are more adequate to capture the influence area of a city than those based on transport infrastructure or administrative delineations. Nous étudions le potentiel des prix du sol comme indicateur de l’efficacité avec laquelle différentes définitions de l’aire urbaine d’une ville capturent l’influence de cette ville. Le cas d’étude employé est la ville de Bruxelles (Belgique). Un modèle hédonique de prix des terrains à bâtir est estimé pour 12 définitions différentes de son aire urbaine, ainsi que pour un continuum d’aire urbaines générées automatiquement. L’hypothèse sous-jacente, fondée sur le modèle d’Alonso-Muth, est que (une fois pris en compte l’effet des aménités locales) l’influence de l’accessibilité au centre-ville sur les prix du sol reflète le niveau d’influence de la ville sur l’aire urbaine choisie pour la définir. Les résultats montrent qu’autant la taille que la composition de l’aire urbaine influencent les déterminants des prix du sol. La taille influence la structure spatiale des prix du sol, qui passe d’un modèle en secteurs (Hoyt) lorsque la définition de l’aire urbaine de Bruxelles est de petite taille à une structure concentrique (modèle d’Alonso-Muth) pour une definition plus large de l’aire urbaine. La composition des aires urbaines entraine quant à elle une variation du niveau d’influence de l’accessibilité au centre-ville sur les prix du sol, du fait de l’inclusion de zones rurales ou de villes secondaires. L’absence de données détaillées sur les transactions immobilières limite la significativité des résultats. Ils démontrent toutefois la pertinence de l’emploi des prix du sol comme outil pour comparer différentes définitions de l’aire urbaine d’une ville. Les résultats obtenus suggèrent également que les définitions des aires urbaines basées sur les flux (navettes domicile-travail par exemple) et sur des valeurs seuils endogènes sont plus à même de capturer l’influence d’une ville sur son environnement que les aires urbaines basées sur les infrastructures de transport ou les limites administratives. This work was partially conducted under the framework of the SustainCity Research Project, to which the authors are grateful for the support. The authors want to thank two anonymous reviewers for their useful comments on a previous version of this paper. 1After decades of urban sprawl, the distinction between “urban” and “rural” areas has become less and less clear. Due to this suburbanization process, identifying the boundaries of metropolitan areas is nowadays a complex issue (Cheshire et Gornostaeve, 2002), as well as a fascinating field of research for geographers and regional scientists. However, despite many empirical works, no consensus appears on the definition of urban morphological agglomeration (i.e. the "built city" - Parr, 2007; Tannier et al, 2011), neither can a universal threshold of population density be associated to the definition of a city for differentiating urban and rural settlements (Pumain, 2003). Moreover, different delineations exist for different purposes (transport management, land use planning, tax receipts), meaning that a large variety of methods and criteria are used, often with different threshold values (see Dujardin et al, 2007). Comparisons are thus hazardous (see e.g. Farmer and Fotheringham, 2011; Thomas et al, 2013), and thereby often limited to simple descriptive statistics such as the total surface, population or number of jobs (see Dembour, 2004; Dujardin et al, 2007 for Brussels, Belgium). 2We propose here a framework that uses the effect of accessibility to the CBD on land prices to compare different delineations of a city. This method has the advantage of being grounded in the classical urban bid rent model of Alonso (1964), where land prices are function of the accessibility to the CBD. The model assumes a clear-cut limit of cities located where the opportunity cost of urban and rural land uses are equal. Hence, in rural areas the influence of accessibility to the CBD on land prices is expected to be null. Assuming that local amenities have been controlled for, the effect of the accessibility to the CBD on land prices should thus decrease when the size of the delineation increases. It should however be noted that the emergence of secondary centres leads to non-linearity in the decrease of land values with the distance to the CBD (see e.g. Fujita, 1979; McMillen, 1996; Anas et al, 1998; Ahlfeldt, 2011). Fujita and Ogawa (1982) and Fujita (1989), among others, have proposed analytical models to introduce such sub centres in the general Alonso-Muth model. Another limitation of the model is that suburban settlements do not show a dichotomy between urban and rural land uses. Yet, Cavailhès et al (2004) have proposed an analytical model where both households commuting to the CBD and farmers can be present in a mixed belt surrounding the city centre. 3Hence, this paper aims to test the intuition that the influence of accessibility to the CBD on land prices will be affected by local conditions (secondary centres or rural areas having loose relationship with the CBD) and that these variations allow to assess the efficiency by which the influence area of a city is captured by different delineations of that city. This work can be related to Bode (2008), who proposed to use the fraction of land prices attributable to economies of urban agglomeration to delineate cities. It also relies on the Uncertain Geographic Context Problem (Kwan, 2012), which states that the spatial configuration of the area that exerts an influence on individuals is uncertain. This uncertainty means that different delineations can be proposed for the same city, but (and this is the point of this paper) that they have different meanings and are not interchangeable, nor easily comparable. 4The analysis presented in this paper can be summarized by the following research question: Does urban land price determinants vary with the size and shape of the functional delineation of the city used? A sensitivity analysis of a land price model to the boundaries of the study area is conducted on the case study of Brussels (Belgium). A hedonic model of land prices (log-linear and semi-parametric specifications) is estimated for 12 delineations of the city (morphological, functional, administrative or based on transportation infrastructure), as well as on automatically constructed delineations. The paper is organized as follows: a typology of functional delineation of cities is given on section 1. We then present the case study and the methodology (section 2). Results are presented in section 3, and discussed in section 4. 5The binary distinction between urban and rural areas has been widely used to capture spatial differences (Schuler et al, 2009), but is no longer valid nowadays. Administrative boundaries are often obsolete: due to the suburbanization process, many cities sprawl out of their “official” limits (Dujardin et al, 2007) and cities fringes show irregular patterns, where recent detached housings estates are mixed with traditional rural buildings and jobs location (Tannier, 2011). Functional delineations, taking into account the economic influence of a metropolitan area, should thus be used to study the urban phenomenon (Cheshire, 2010). 6A wide range of different criteria and methodologies exists to delineate cities (Table 1; see Federal Register, 2000; Dujardin et al, 2007 for reviews), but most functional delineations of cities (the “grande aire urbaine” in France, see INSEE, 2014) can be divided into an "urban core" surrounded by an "outlying area". The former one relates to Pôle urbain (France), Central counties (U.S.) and Operational agglomeration (Belgium), which are all defined (at least partially) by the continuity of built-up areas. It corresponds to the very dense urban center. "Outlying areas" can be associated to the “couronne périurbaine” (France), the Outlying counties (U.S.) or the Metropolitan labor area (Belgium) and are merely defined by home to work commuting. They include all areas having a functional relation with the CBD, even if morphologically rural (Rozenblat and Cicille, 2003). Intermediary delineations such as Central zones (Switzerland) and Urban region (Belgium, Figure 1) have also been proposed, based on a mix of socio-economic, attractiveness and dynamic indicators (Le Gleau et al, 1996; Van Hecke et al, 2007). 7A typology constituted of three nested categories of functional delineation can thus be proposed (Table 2). These categories have different meanings, and are based on various types of criteria. Hence, the typical size of the delineation changes between categories. Subsequent analyses aim to evaluate the influence of these size and/or composition variations on land price determinants. 8Brussels is the capital and main employment center of Belgium (in 2007, 18.8 % of Belgian GDP was produced in the BCR, see Thisse and Thomas, 2010). It is an outlier among European cities in that its official extension (the Brussels-Capital Region, hereafter BCR) is so small, yet so politically significant, relative to its functioning whole (Thisse and Thomas, 2007; Cheshire, 2010).). For instance, about 670 000 jobs were located in the BCR in 2007, 229 500 being occupied by people commuting daily from Flanders, plus 126 500 from Wallonia (Thisse and Thomas, 2010). It is thus clear that the influence of Brussels sprawls out of the boundary of the BCR (see Dujardin et al, 2007). However, given the political context of Belgium, none of the functional delineations proposed for the Brussels metropolitan area have made their way out of the academic world (publicly-funded researches on Brussels are often limited to the BCR). This lack of consensus has encouraged geographers and economists to propose their own definition of the Brussels metropolitan area, making this city a fascinating case study for comparing urban delineations. The different delineations of Brussels used in this work are presented hereafter. Brussels-Capital Region (BCR) includes 19 municipalities and corresponds to the very dense urban center. The Former province of Brabant (Brabant) 1 is constituted of 111 municipalities. 10Van der Haegen and Pattyn (1979) have been the first to propose functional delineations of Belgian cities. The latest revision by Van Hecke et al. (2007), using the population census of 2001, combines a morphological agglomeration defined by the continuity of built-up areas (maximal distance between buildings less than 200 meters) and three nested delineations (Operational Agglomeration, Urban Region and Metropolitan Labour Area, see Figure 1). The three latter match the boundaries of the municipalities (the smaller administrative units for which land prices are available) and have thus been considered. Figure 2 shows the extension of these delineations for Brussels. A map for the entire country is given in the appendix (Figure 6). 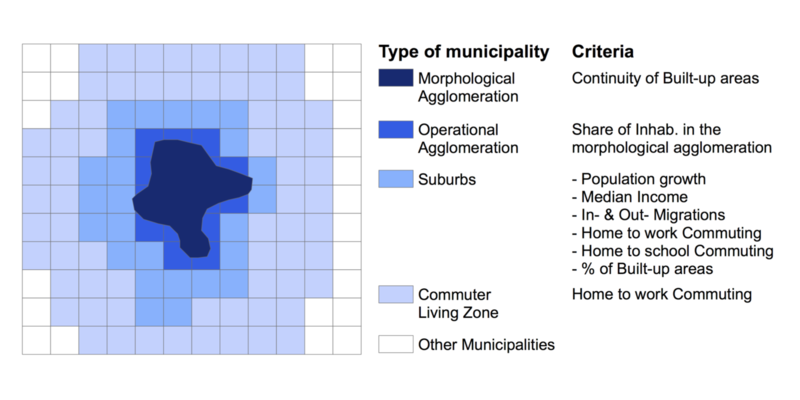 Operational Agglomeration (OA) is the set of municipalities having more than 50 % of their inhabitants in the morphological agglomeration. In 2001, it includes 36 municipalities, and corresponds to the densely built area. Urban Region (UR) (62 municipalities) includes the OA plus the suburbs (26 municipalities), which are defined by a mix of socio-economical indicators. UR is widely used as the definition of the Brussels city region in scientific work (see e.g. Beelen et al, 2007; Riguelle et al, 2007 or Verhetsel et al, 2010). Metropolitan Labour Area (MLA) includes 122 municipalities: UR plus the 60 municipalities of the Commuter Living Zone, or CLZ, defined as all municipalities having more than 15% of their active population commuting daily to the OA. Note that the presence of regional cities (Mechelen and Leuven) north and east of Brussels limits the extension of the MLA on these directions (Van Hecke et al, 2007). The Official RER Zone (RER) is defined as all municipalities "within a radius of about 30 km from Brussels" (Moniteur Belge, 2004; pg. 97), and includes 136 municipalities. An Inner RER Zone (InnRER) is defined by the same law as the OA plus all municipalities contiguous to the BCR, for a total of 41 municipalities. Furthermore, potential effects of the RER have been studied using an Extended RER Zone (ExtRER) of 147 municipalities (the RER Zone plus 21 additional municipalities, without justification – see Boon and Gayda, 2008). And a job basin (Thomas et al, 2013) that uses the same methodology than phone basins but on an OD matrix of home-to-work commuting fluxes in 2008. This delineation includes 105 municipalities. 13Finally, the Union of the delineations of Brussels is here defined as all municipalities (160) belonging to one of the aforementioned functional delineation. Table 3 summarizes the extension of these delineations of Brussels. The BCR (19 municipalities) is chosen as initial delineation of the continuum (iteration 0), and the Union delineation (160 municipalities) as its maximal extension. The delineation i is defined as all municipalities belonging to the i-1 delineation, plus the municipality not included in i-1 having the minimal Euclidian distance to the Brussels CBD. This procedure is repeated iteratively (Figure 3) until all municipalities are included. The continuum thus consists in 141 delineations (i.e. 160 – 19). 15This continuum assumes that the influence of Brussels can spread evenly in all directions (which is not the case due to the presence of regional cities close to Brussels, see section 4). Moreover, it corresponds to “mechanical” delineations, without any assumptions on the threshold value used. Hence, it will provide an indication on the maximal variation range of the land price model parameter estimates. 16The aim here is to compare different delineations of Brussels, not to build the “best” possible model of land prices for each of them. For estimations of detailed land price models on either Belgium or Brussels, we refer the reader to Goffette-Nagot et al, 2010, Cavailhès and Thomas, 2012 or Pholo Bala et al, 2013. The model used here is limited to a simple specification, with a limited amount of explanatory variables. This approach has been preferred due to the aim of this work, but also because the information on land prices is rather thin in Belgium. No individual transactions are disclosed. The only data offered by the Belgian Directorate-general Statistics and Economical Information (http://www.statbel.fgov.be) is an annual series, available only at the level of the municipalities, of the total number of transactions during the year, the overall value of these transactions (€) and the total surface of the parcels sold (in square meters). Hence, the average price for 1 square meter of developable land sold within the municipality between 2006 and 2008 is used here (Table 4). The three-year period reduces biases due to very small numbers of transactions. Still, five municipalities within our study area have less than 10 transactions and have been excluded. Prices are deflated between years by the consumption price index. Developable lands are preferred to houses since they have less intrinsic characteristics, and it can then be assumed that their average price is mostly the product of the municipality location. As expected, land prices are maximal for municipalities close to Brussels (Figure 4) and decrease with the distance. All other things being equal, prices tend to be higher in Flanders than in Wallonia, due to higher population densities and to land use policy (Goffette-Nagot et al, 2010). 17Control variables are the following: Population density, which is the number of inhabitants per square kilometres in each municipality in 2008 (Figure 4), and Income, equal to the median earnings per household in euros for fiscal year 2008, are used as socio-economic indicators. Sources for these data are the DGSIE. The Travel time to the closest main (“IC/IR”2) railway station is used as a local amenities indicator and accounts for the proximity of the municipalities to both the public transport network and to secondary centres with retail activities. The Forest cover, expressed as the share of the total surface of the municipality covered by forest (CORINE land-cover database, European Environment Agency: http://www.eea.eu.int), is used as a green amenities indicator. Given the average size of municipalities (35 km2), it is impossible to test for the presence of parks or schools (Goffette-Nagot et al., 2010). Finally, a dummy variable (Wallonia) equal to 1 if the municipality belongs to the Walloon region, and 0 otherwise (BCR or Flanders) is considered. 18To compare the different delineations of Brussels, the key variable of the model is the indicator of the accessibility to Brussels, since it will capture the influence of the city on its neighbouring areas. For that purpose, the Travel time to (the CBD of) Brussels, by car, in minutes and congestion included, is used (data from Vandenbulcke et al, 2007). In addition, a gravitational measure of the Accessibility to jobs is also used, and defined as follows: for each municipality i, this variable is equal to the log of the Shimbel index (of the travel time by car) between i and all other municipalities in Belgium, weighted by the total number of jobs (self-employed excluded) located in these municipalities in 2008. Jobs data come from the Belgian National Social Security Office (http://www.onss.fgov.be). Although it has been shown that the linguistic border between the French and the Dutch-speaking parts of Belgium significantly reduces interactions (Dujardin, 2001; Blondel et al, 2010), estimating the magnitude of this effect is a complex task. Hence, we do not consider any border effect here. 19Given the importance of the BCR as an employment centre, these two accessibility indicators are correlated (Pearson correlation: -0,86***). 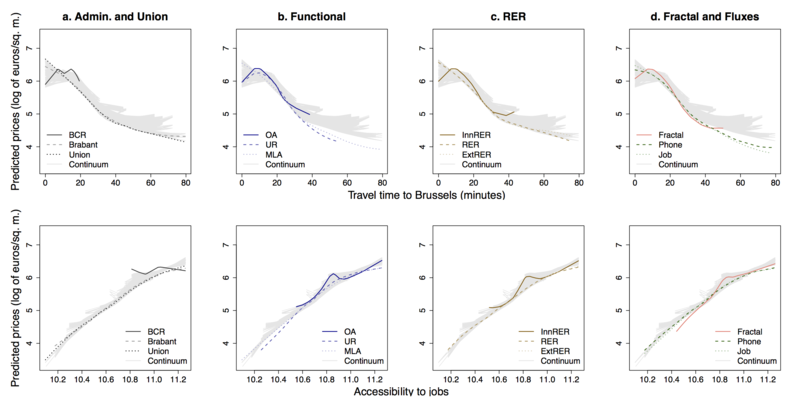 Still, their nature is different: the travel time to Brussels’ CBD only measures the accessibility to that specific location, while the accessibility to jobs takes into account all potential destinations. Hence, it is expected that the effect of this latter variable should be similar for all delineations of Brussels, while the influence of the travel time to Brussels’ CBD would vary according to the size or the composition of the delineation used. 20The influence of the delineation of a city on the land price determinants in that city is estimated using a two steps methodology. First, a hedonic model of land prices is estimated on the functional and automatically-generated delineations of Brussels presented in Section 2.1. This model is estimated by OLS (1) and by a semi-parametric specification (2) (mixed model representation of penalized splines, see Ruppert et al, 2003). For the latter one, the relation between land prices and the accessibility indicator (either the travel time to Brussels’ CBD or the accessibility to jobs) is not constrained to a linear form. 21Where Pi is the average selling price, in euro per square meter, of developable land in the municipality i, Xijcontrol a vector of the j control variables in i and Xiaaccessibility the accessibility indicator a in i, α is a constant and εi the random, normally distributed, error term associated to each observation i. Definition and sources of the dependant and independent variables have been discussed in the previous subsection. Since this work is exploratory, the benchmark specification of the land price model for each delineation of Brussels has been determined by a stepwise procedure, using the AIC statistics to select the set of control variables (see Venables and Ripley, 2002). Three different cases are considered, in order to compare the effects of the accessibility indicators (Table 5). The specification implemented for the continuum of delineations is based on the variables found significant for functional delineations (see Section 3). 22This first step allows for a global analysis of the extension of the boundaries of the study area on the land price model. In the second step, local variations of the relation between land prices and accessibility have been examined through the estimation of a geographically weighted regression (GWR) model (Fotheringham et al, 2002). The specification of the GWR model is given by (3), where u indicates that the parameter βk(u) describe the relation between land prices and the independent variable k around the location u, and is specific to that location (Charlton and Fotheringham, 2009). Other notations are identical to those of equation (1). 23A Gaussian kernel is used, and the bandwidth is determined by the cross-validation optimization methods (Fotheringham et al, 2002). For each accessibility indicator, three specifications are estimated: (a) a “simple” one with the accessibility indicator as only independent factor, (b) a “control” specification with the variables found to have an influence on land price in all cases (see section 3) and (c) a “fitted” specification using the variables selected by case B and C of the stepwise regression for the Union delineation. This second step allows us to assess wether the variations observed between delineations can be explained by local variations of the relationship between land prices and the accessibility indicator. 24The estimated parameters of the land prices models are presented in the appendix (Table 9 and 10). Using the variables selected by the stepwise procedure (Table 6), functional delineations of Brussels can be divided into two groups that correspond roughly to “small” vs. “large” delineations of Brussels. It should be noted that for the BCR and up to the Central RER Area, the number of observations is small and limit the robustness of econometric estimations. Results should then be considered as illustrative for these delineations. Moreover, it appears that the AIC criterion leads to keeping into the model variables not significant at the 5% level. This is especially the case for these “small” delineations, and for the forest cover variable. 25As expected, Population density and Median income influence land prices in all delineations, while the local amenities variables (Forest cover, Travel time to the closest railway station and the Wallonia dummy) are only selected in large delineations. When the two accessibility indicators are included in the models (case A), the accessibility to jobs is always preferred to the travel time to Brussels CBD. For case B, the Travel time to Brussels is only selected for large delineations. For case C, the Accessibility to jobs is selected for all delineations except the Urban Region. 26The specifications estimated for cases B and C are re-used for the semi-parametric regression model. For automatically generated delineations, the specification is the same for all iterations, and includes the variables found to be selected in all cases: Population density, Median income (plus the Wallonia dummy when the continuum reaches this region) and, according to the case considered, the Travel time to Brussels or the Accessibility to jobs. For a given delineation, the estimated parameters of the control variables are never significantly different when estimated by OLS or by the semi-parametric method. 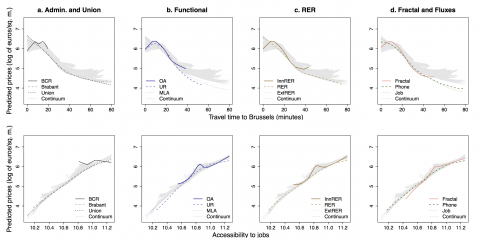 Nevertheless, Figure 7 (in Appendix) shows that if the land price gradient is almost linear for the Accessibility to jobs (but becomes slightly steeper for low values of accessibility), this is not the case for the Travel time to Brussels. For this variable, the land price gradient is flat for the municipalities close to Brussels, becomes steep for those located between about 20 and 35 minutes from the CBD and then flattens again. Relatively strong differences in the decrease of the slope can be observed, depending on the delineation. 27A geographically weighted regression model has then been used to investigate local variations of the relationship between land prices and the Travel time to Brussels or the Accessibility to jobs. Figure 5 shows the variations of the estimated parameter of the accessibility indicator for the different specifications of the land price model (specification using the “control” set of independent variables is identical to those of the continuum). 28These findings suggest that, when studying a metropolitan area, a trade-off has to be made between the extension of the study area (larger delineations ensure that all areas under the influence of the city are included) and the actual influence of the city within the study area (which decreases with the radius of the delineation). Both the differences in size and composition of the delineations of a city influence the relationship between land prices and accessibility to the CBD. The methodology used to compare delineations of Brussels (and the case study itself) suffers different limitations that should first be examined. 29This work can be related to the Modifiable Areal Unit Problem (MAUP), to which regression methods are known to be sensitive (see Arbia, 1989; Fotheringham and Wong, 1991). The variations of parameter estimates were thus expected. The MAUP usually refers to the variations of size (equivalently the number) and/or shape of the basic spatial units, but variations of the extension of the study area can be considered as an extension, since it consists in variations in the number of spatial units. The results are partially inconclusive since variations of the influence of accessibility to the CBD on land prices are weak. A possible explanation is the lack of detailed information on real estate transactions: as described in section 2.2, only the average value at the level of the municipalities (average size of 34 sq. km) was available. Although Brussels is a fascinating case study, because of the numerous different delineations of the city proposed in the literature, data limitations hence reduce the robustness of statistical analysis. 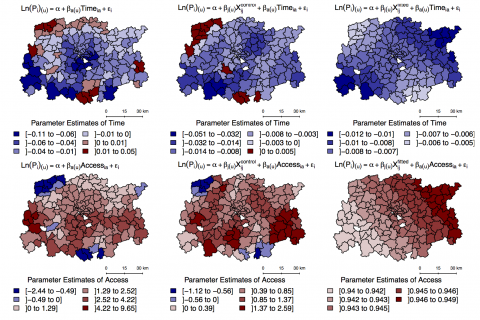 Nevertheless, even if parameter estimates do not show significant differences, the variables selected by the stepwise procedure and the slope of the predicted land price gradient can be used to compare delineations of Brussels. 30The Alonso-Muth model assumes that the economic utility of a household increases with the accessibility to jobs (i.e. is inversely proportional to the distance to the CBD in a monocentric case) and decreases with land prices. The positive parameter estimates of the Accessibility to jobs variable (that take into account all jobs in Belgium) are thus consistent. This variable has a significant influence on land prices for all delineations of Brussels. No significant differences are observed in parameter estimates and the predicted land price gradient is linear when expressed as a function of this variable. 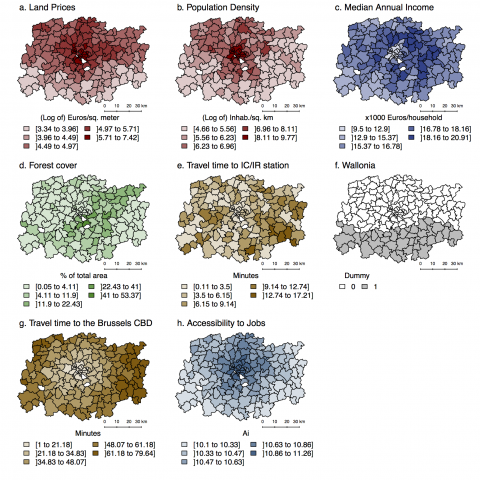 These results are consistent with Ahlfeldt (2011), who found that gravity-based accessibility indicators are better at capturing the employment accessibility than the traditional distance to the CBD. Selection of the accessibility to jobs rather than the distance to the CBD by the stepwise procedure (case C, Table 6) means that the distance to the CBD does not have a significant effect on prices when such gravity variables are included, which is precisely the result obtained by Ahlfeldt (2011). Hence, the Travel time to Brussels is less adequate to capture accessibility to jobs, since it only reflects the accessibility to the portion of the jobs located in the CBD. However, this latter characteristic is the reason why this variable is used to assess the efficiency by which the delineations of Brussels capture the influence area of that city. 31It should first be noted that no optimal delineation appears to estimate land prices, since adjusted R2 are similar for all delineations of Brussels larger than the Urban Region (Table 9 and 10, in appendix). Nevertheless, differences appear in the specification of the land price models. Delineations smaller than the Phone basin are limited to socio-economic or environmental amenity factors, and the travel time to the CBD does not have a significant influence for them. On the contrary, prices for developable land and single-family houses are strongly influenced by Brussels in the entire province of Brabant (Vanneste et al, 2007). 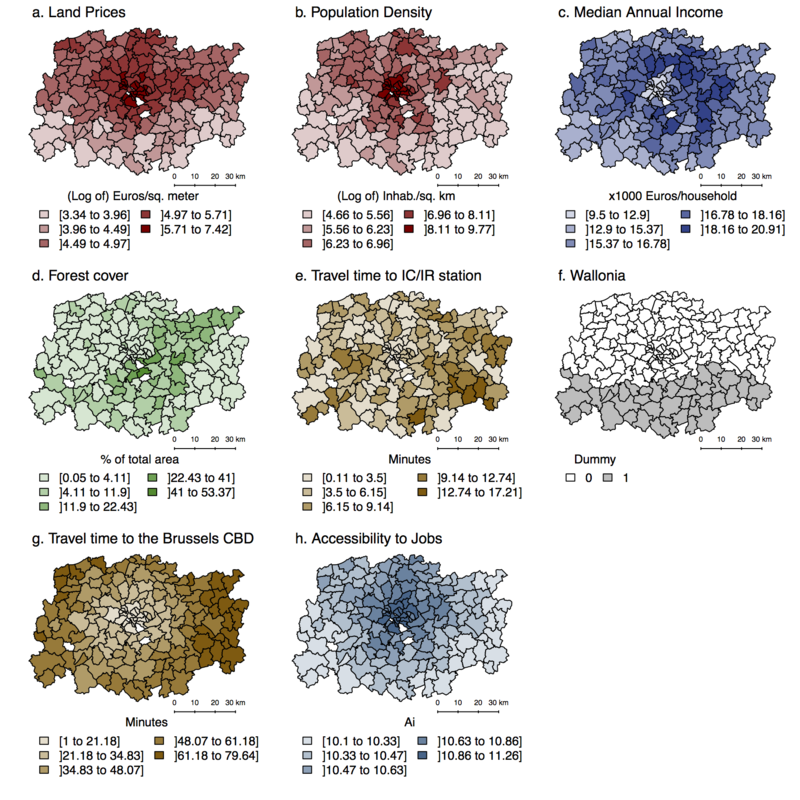 When including these municipalities in the study area, the travel time to the Brussels CBD becomes an important determinant of land prices (and it remains significant for all larger delineations). 32The variations of size influence the nature of the area included in the delineation of the city. Relatively small delineations of Brussels have a land price structure that corresponds to Hoyt’s sector theory (1939). In the case of Brussels, this structure can be explained by negative externalities: land price structure in the BCR shows a quadrant structure due to "a socio-economic cleavage, with working class neighbourhoods along a north to south-west axis, and a rich south-east quadrant" (Vandermotten et al, 2009; pg. 82). This deprived axis expends further than the BCR (see e.g. Thomas and Zénou, 1999; Kesteloot et al, 2001; Dujardin et al, 2008) and is visible in the distribution of land prices and median annual income (Figure 4). For large delineations, the land price structure is mostly consistent with the Alonso-Muth model, even if the accessibility to secondary centres (for which the travel time to IC/IR stations is a proxy) has to be taken into account by the model. 33The composition of delineation appears to depend on the criterion used (see below) and can also influence its nature. 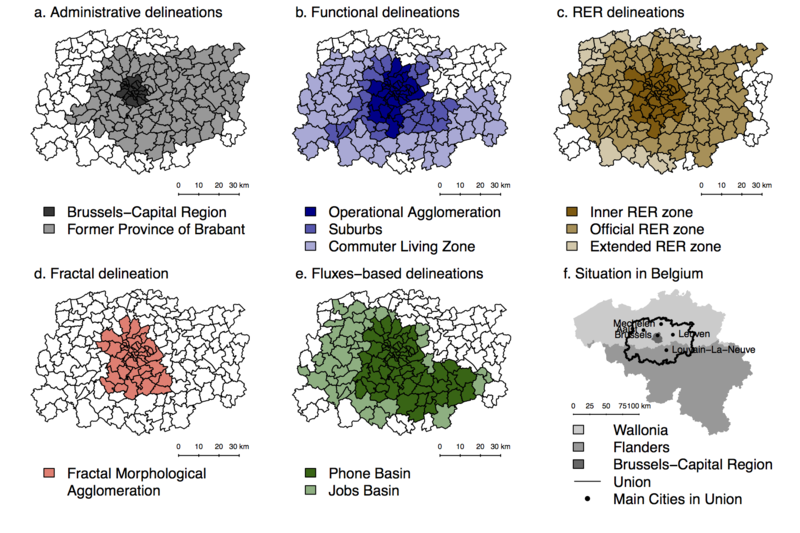 Among large delineations of Brussels, two groups can be distinguished: delineations based on fluxes (Phone, Job and MLA) have a steeper land price gradient than the one observed for RER zones (official and extended), Brabant and Union (Figure 7). The continuum of delineations shows an even gentler slope of the land price gradient. 34The latter group has a larger proportion of its municipalities located in Flanders. All other things being equal, land prices tend to be higher than in Wallonia due to the scarcity of space and the denser urban network (Goffette-Nagot et al, 2010). Moreover, the complete Metropolitan Labour Areas (MLA) of Leuven (12 municipalities) and Mechelen (5) are included in the Union of delineations of Brussels, together with eight municipalities belonging to the MLA of Antwerpen or Gent (see Figure 6, in Appendix). One municipality of the MLA of Charleroi (in Wallonia) is also included. For these municipalities, the percentage of people commuting (to work and to school) or migrating to the secondary centre is higher than to Brussels (Van Hecke et al, 2007), and no significant relationship is found between land prices and the travel time to Brussels (Table 7). 35The MLA of Brussels is also subject to some drawbacks. The threshold value used by Van Hecke et al (2007), 15% of commuters to the Operational Agglomeration, being weak compared to the one used in France (40%) or in the US (25%, see Dujardin et al, 2007), the Commuter Living Zone includes rural areas with relatively low land prices and population density (Bruck, 2002). The relationship between land prices and travel time to Brussels’ CBD is thus significantly weaker for that zone. 36Different delineations exist for various purposes, and it should thus be recognized that they are not interchangeable. Still, the methodology or criteria chosen to delineate a city has a clear influence on the size and the composition of the delineation produced and, as a consequence, on its nature (Table 8). It should also be recognized that some criteria are more adequate than others to delineate the influence area of a city. For instance, it has long been noted that morphological delineations of cities do not capture the enlarged range of spatial interactions allowed by the modernization of transport technology (Pumain, 2003). For our case study, the Operational Agglomeration (i.e. a morphological delineation adapted to municipalities’ boundaries) is limited to the dense city center and does not include the suburbs, which have strong functional relationships with the urban center and are the results of the suburbanization process (Riguelle et al, 2007, Van Hecke et al, 2007). These suburbs are integrated in the Fractal morphological agglomeration, which appears thus more accurate (it should be noted that Tannier and Thomas (2011) use data from 2009, while those used by Van Hecke et al. (2007) date back to 2001). 37The findings presented here suggest that large delineations of cities can be subject to the opposite problem, i.e. an overestimation of the city’s influence area. This problem arises from the inclusion of secondary centres or rural areas (see section 4.3) and can be related to inadequate criterion and/or threshold values in the methodology used to delineate the city. RER zones are based on the physical extension of the railway network, rather than on the actual commuting pattern. The continuum of delineations was defined in a similar way by using the Euclidean distance to Brussels’ CBD. These delineations assume that the influence of Brussels spreads evenly in all directions. Although this hypothesis holds for an isotropic and featureless landscape as the one assumed by the Alonso-Muth model, this is clearly not the case in a highly urbanized country such as Belgium. To sum up, the validity of these delineations of Brussels appears thus limited. Interactions between agents and space should be preferred to delineate cities. 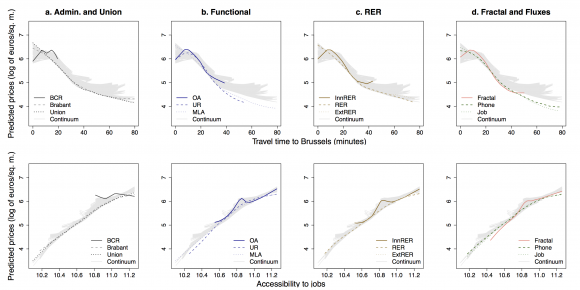 Indicators such as commuting fluxes remain subject to biases due to arbitrary selected threshold values, but recent efforts in that respect (see Farmer and Fotheringham, 2011; Thomas et al, 2013) have shown the potential of methods where this threshold is endogenously determined. 38In this paper, the potential of land prices as a tool for comparing delineations of a city has been examined. This indicator has the advantage of being independent of the methods and criteria used to delineate cities, hence limiting the risk of endogeneity. Nevertheless, local variations in the influence of Travel Time to Brussels appear only for simple and control specifications of the land price model, but they become non-significant when the fitted specification is used (Figure 7). The lack of detailed, transaction-level, data on land prices may constitute an explanation, as well as the fact that central Belgium is highly urbanized. However, the same results are observed for Accessibility to jobs, suggesting that the variations of parameter estimates may be due to misspecifications issues. Hence, the assumption that the influence of accessibility to the CBD on land prices should vary depending on the composition of the study area is poorly supported by the results. Although analysis of land price determinants among different delineations of Brussels gives interesting insights on the nature of these delineations, further researches are thus necessary. As already mentioned, more detailed data on land prices are needed. An interesting development could be to use land prices determinants as a method for delineating cities, following the framework proposed by Bode (2008). 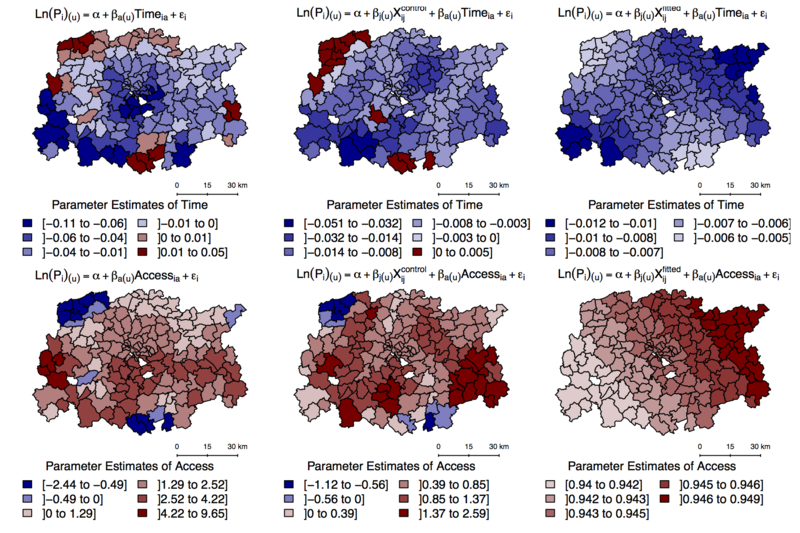 39An empirical sensitivity analysis of urban land price determinants to the size and composition of the study area is proposed in this paper. The underlying assumption, grounded in the Alonso-Muth model, is that variations of the influence of accessibility to the CBD on land prices can be used to assess the efficiency by which the influence area a city is captured by different delineations of that city. The case study, Brussels (Belgium), was selected due to the large number of delineations of the city proposed in the literature. Nevertheless, it has been found that the lack of detailed data on real estate transactions limits the robustness of the statistical analysis. The following findings can be highlighted: the size affects the land price structure, which corresponds to Hoyt’s sector theory for narrow delineations of Brussels and to the Alonso-Muth model for large ones. The composition of the delineation rather affects the magnitude of the influence of the accessibility to the CBD on land prices, showing that delineations based on transport infrastructure or a low threshold value for commuting fluxes can exceed the influence area of the city. Hence, the nature of the delineations evolves from a very dense urban centre to a polycentric region, and is directly linked to the criteria used. Delineations based on fluxes and on endogenous thresholds appear more robust to capture the influence area of a city than traditional delineations. Fujita M., 1989, Urban Economic Theory, Cambridge University Press, Cambridge, MA. Pumain D., 2003, Scaling laws and urban systems, Paris, MIMEO. Rozenblat C. and Cicille, P., 2003, Les villes européennes. Analyses comparatives, Paris, La Documentation Française. Ruppert D., Wand M. P. and Carroll R. J. (2003) Semiparametric Regression, Cambridge, Cambridge University Press. 1 “Former” since it has been divided among the BCR, the Walloon Brabant province and the Flemish Brabant province in 1995. 2 IC (InterCity) and IR (InterRegio) is the name given by Belgian railways for fast, direct trains. By extension, the « IC/IR stations » are the stations where these trains stop.